Uncertainties v2.4.8.1 (http://pythonhosted.org/uncertainties/) is Python module for calculations with uncertainties, that transparently handles calculations with numbers with uncertainties (i.e., error propagation). It can also yield the derivatives of any expression. 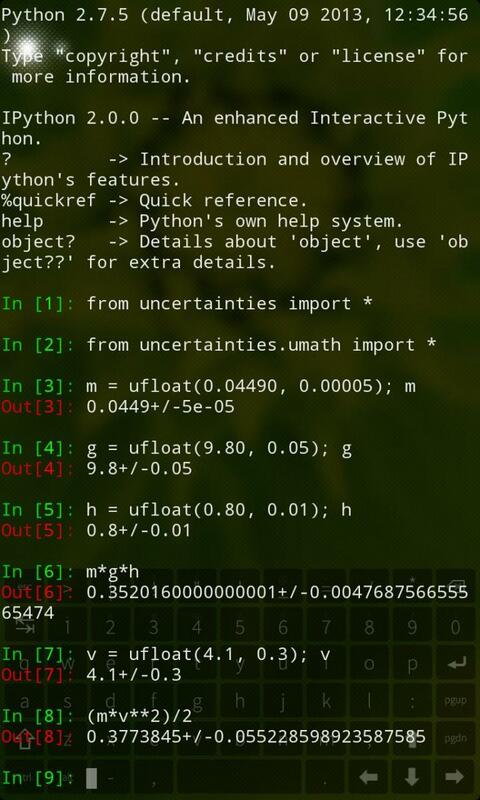 For interactive use of Uncertainties, it is recommended to install IPython for Sailfish OS. See Python 3 version of Uncertainties here. For source-code of Uncertainties for Mer / Nemo / Sailfish, see the Mer COBS site project. Uncertainties 2.4.8.1 (31/04/2016) for Mer/Sailfish (07/08/2016).